I am an aviation content devourer, someone who consumes magazines, blogs and podcasts greedily or voraciously. I am not embarrassed to admit that, as I know most pilots are the same way. With less than a half a percent of the population being pilots we don't get our aviation fill talking at the water cooler. We need to get out to the airport or seek out aviation content to keep us satisfied. So when I receive a notification that my most recent AOPA Pilot magazine is available for download, a smile hits my face as I fire up the iPad and download the magazine. Within a few hours and usually in one sitting I have devoured the magazine and my smile erodes as I realize it could be days or weeks before another enjoyable aviation magazine is delivered. I recently stumbled upon Loop Magazine which is a European aviation magazine that is now exclusively available by iPad, and it is FREE. I would venture to say this is the best aviation magazine you are not reading today, but you should be. I was thrilled to learn they offer not only well written and interesting aviation articles but deliver their content in a format that takes advantage of the power of the iPad. Each article offers additional photos and interactivity that would not be available in a print magazine. This is a magazine that was reborn as a digital magazine and instead of having a version adapted for the iPad the entire magazine is designed and developed to maximize the power of the tablet. They have seamlessly integrated animation and video throughout the magazine.. The only complaint I have is that the magazine is not long enough, but that is me just being greedy again. 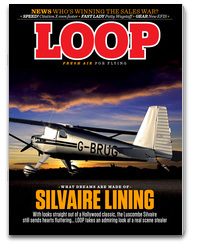 If you have an iPad download the Loop App then begin downloading the current and past issues. The same company also publishes P1 Aviation Magazine, a business aviation magazine and Blades a magazine dedicated to rotor-craft, both of which are free. They also offer an annual magazine called FlightTest for $0.99 per issue. Flighttest features a collection of stunning aircraft highlighted through beautiful photos and video. In the 2011 edition there are more than 250 photos and 40 minutes of video. The magazine reads completely different in horizontal or vertical mode so there is a ton of content to discover. Discovering Loop makes me wonder what other great aviation content is out there that I am missing out on. What is your favorite hidden gem for aviation content? I am in love with IFR Magazine. In my opinion, they have the best content out there but unfortunately are still print only. Hopefully, they will transition to digital at some point but until then, I will be eagerly opening my mailbox to see if my next issue has arrived. i agree with jon. IFR Magazine must be followed by all pilots.